Our solid brass, no-caulk shower drain is designed for use in all HYDRO-BLOK shower pans. The drain body seals to the shower pan with fiber and rubber washers. 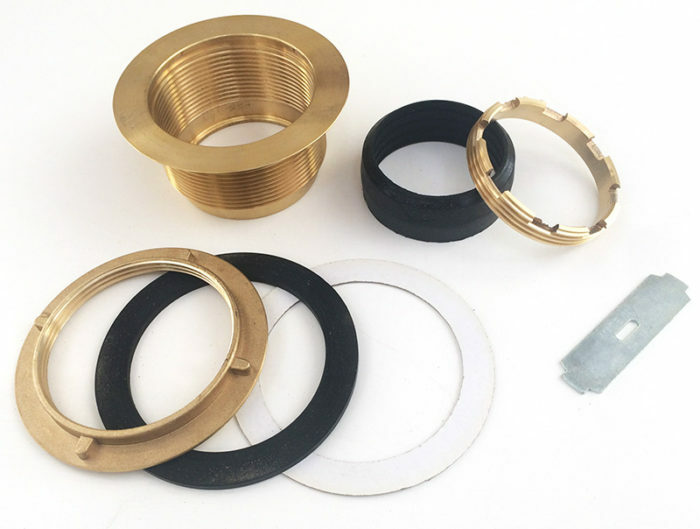 The drain kit is secured to your 2″ drain pipe with a rubber gasket that does not need caulking to waterproof the connection. The HYDRO-BLOK Stainless Steel Drain Cover and Tray with Plastic Riser is a perfect fit for the Brass Drain Kit. A HYDRO-BLOK Brass Drain Kit is included with each HYDRO-BLOK Shower Pan and is available separately form your HYDRO-BLOK dealer. UL and CSA Approved.